Achel | Beer Apprentice - Craft Beer News, Reviews, Interviews and Info. Hi guys. For today’s craft beer review I’m going to be trying the Achel Extra produced by the Brouwerij der St. Benedictusabdij de Achelse located in Hamot-Achel, Belgium. I’ve really been in the mood for a Trappist brew lately and when I saw this one on the shelf, I just had to give it a go. I couldn’t find any information regarding this particular beer on the website, http://www.achelsekluis.org/, but I was able to gather a commercial description from ratebeer.com. 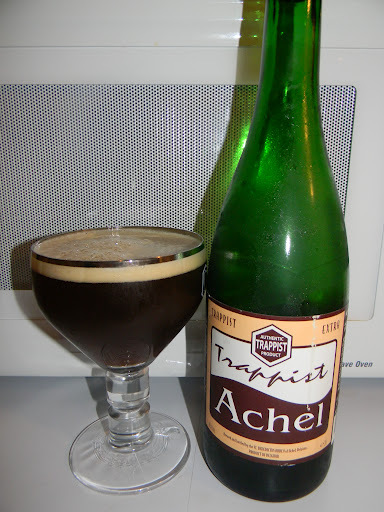 Huge, copper-colored, bottle-conditioned ale, still hot off the presses, Achel Trappist Extra is the latest from the tiny brewery at the St. Benedictus Abbey at Achel, in the Northeast of Belgium. At this year’s World Beer Championships in Chicago, the Extra was easily the best of the many Trappist beers tasted, scoring 97 points and an “Exceptional” rating. You will find this a very satisfying beer, with just a little malt sweetness, dried fruit flavors, warm sherry notes, and a brisk balancing backdrop of fresh hop bitterness. This brew comes in a 25.4 oz. bottle and it has an ABV of 9.5%. It poured a burgundy color with a copper/orange sheen around the bottom of the chalice. It formed a light tan head from a gentle pour. It wasn’t particularly large in size, but it was smooth and mostly creamy. The retention time was decent and the lacing looked ok too. The aroma brought forth hints of dark fruit. Mostly plum and fig. A slight relish of toasted wheat bread and yeast along with touches of chocolate and light caramel. Only the most faint waft of clove was found along the spice realm. This Quad wasn’t as robust or strong as some of the others that I’ve tried, however it seemed better balanced and harmonized in my opinion. The flavor was very, very nice. Stabs of dark fruit. Figs, dates, plums and a bit of grape as well. Flavors of yeast, toasted breads and biscuits. The chocolate and caramel malt that I found in the aroma were very subdued in the taste. They were still there, but maybe just a touch underscored. The dark fruits were the primary players in the taste I thought. The clove stepped up towards the end of the drink after it had time to warm at bit. Slight savors of alcohol were found as well. The mouthfeel was a sturdy medium. Smooth, kind of creamy and dry. A light, easy going warmth was felt from the alcohol and a great amount of carbonation really tickled the tongue. A good dose of flavor was left on the palate after the sip too. I tasted it for quite a while after the bottle was finished. Overall, I really liked the Achel Extra. It succeeded in quenching my Trappists thirst that’s for sure. 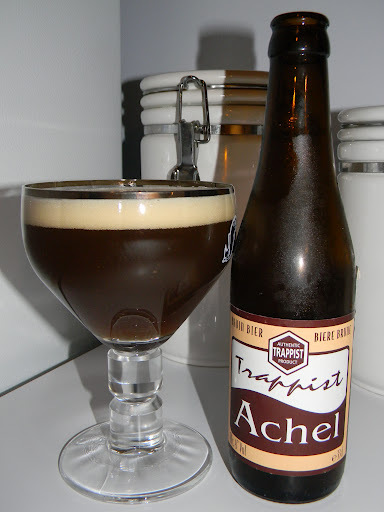 I think Achel deserves more respect than it gets in the “craft beer world”. It seems that most dismiss their brews when they think of an authentic Trappist beer. One thing is for sure…. I don’t. I think these brews have plenty to offer, are easily drinkable and are relatively easy to obtain. If you guys have yet to try anything from Achel, I would highly recommend it. I think you will be rather impressed.